In my assessment, the most undervalued native tree is the sweetgum. Due to its abundance – and to the sweetgum’s fruits, which look like miniature, medieval torture devices that litter the ground and clog lawnmowers – the sweetgum is condemned by many as a trash tree. Others might have a NIMBY response to sweetgums: they appreciate them along the highway, just not in their backyards. Star-shaped sweetgum leaves turn a rainbow of colors in the fall, indicating its complex chemistry. Liquidambar, or sweetgum, is one of the sacred sources of Mayan copal resin. A few features about sweetgums, though, point to this tree being more interesting than current conventional wisdom perceives. 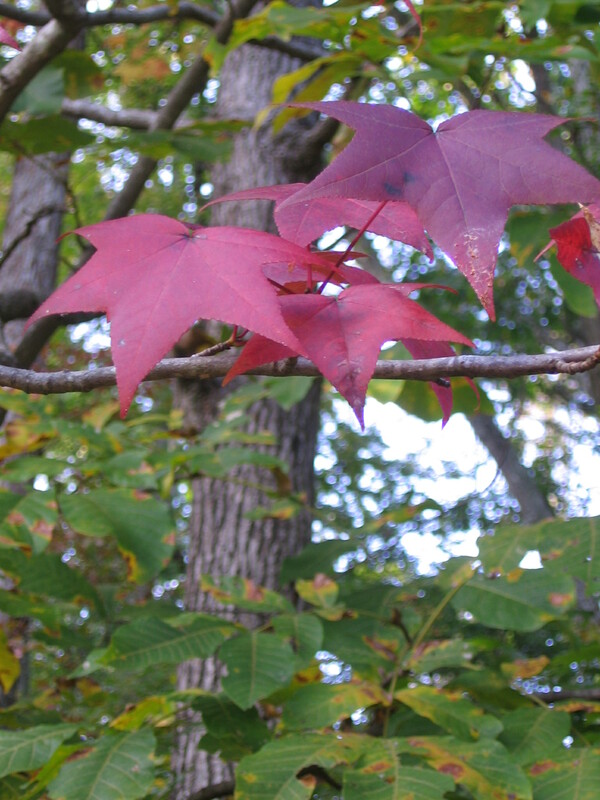 During the fall, few trees offer the spectacular multi-hued, rainbow of color seen in the sweetgum’s star-shaped leaves. From shiny green, to yellow, to red, to deep eggplant-purple, sweetgum’s color spectrum appears to be indicative of its complex chemistry. Within both common and botanical names of the sweetgum (Liquidambar styraciflua), we can gather that the tree offers a liquid, resinous, sweet-tasting gum. In the old days, the balsamic resin was called American styrax, or storax, and used as a natural chewing gum. The balsam resin is harvested by making a gash inside the inner bark so the liquid can ooze out. The balsam resin is medicinal, and further processing can produce tinctures and gums that also are medicinal. Traditionally Native Americans used the resin and inner bark as an aid for wounds, sore throats, coughs and in treating infectious diarrhea. Chemical analysis has found astringent tannins and antimicrobial, anti-inflammatory compounds in sweetgum, which make it effective in treating skin and mucosal infections. The leaves also contain many of the medicinally active compounds. Ethnobotanical research by the Foundation for Latin American Anthropological Research documents Liquidambar styraciflua, or arbol de estoraque, as one of the sacred sources of copal resin used for incense and burned during religious ceremonies. South Carolina Civil War surgeon and botanist writes that sweetgum incense was used in Mexico as an “excitant of the mucous system” and antimicrobial for infections of lungs, intestines and urinary tract. 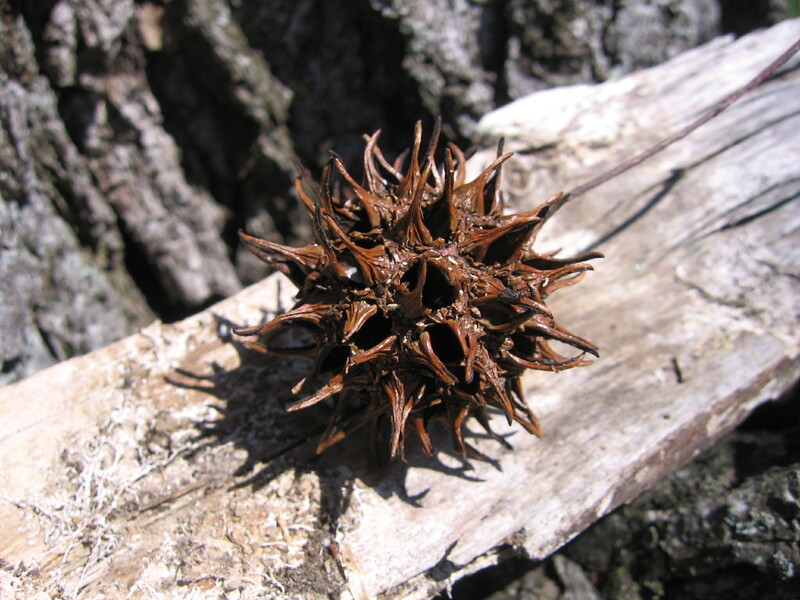 Sweetgum balls look like miniature medieval torture devices. Archeological research of pre-Columbian Aztecs discovered evidence of a large trade of Liquidambar for incense. “Trash tree” is clearly a perception. Another traditional use by Cherokee Indians was to make a tea infusion of the inner bark as a sedative to calm the nerves. Recent pharmaceutical research found that an alcohol extract of sweetgum reduced angiotensin II signaling, thereby reducing hypertension. The researchers isolated chemical constituents, benzyl benzoate and benzyl cinnamate, and discovered they served as antagonists for angiotensin II-induced hypertension. Will this trash tree be revalued as a native treasure? Although sweetgums are prolific and long-lived, they are sensitive to urban sprawl and drought. 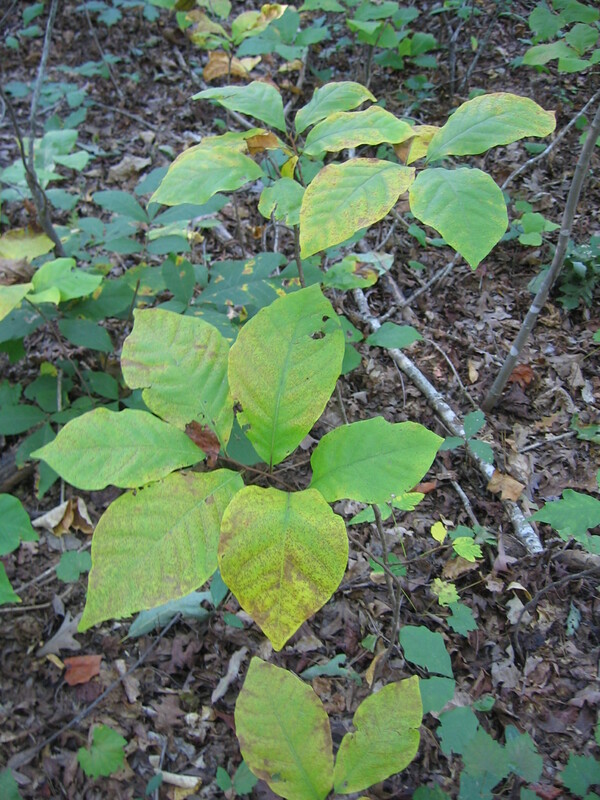 According to a North Carolina State University study of sweetgums growing in the mid-Atlantic region of the United States, foliage is damaged from phytotoxic levels of troposheric ozone. We might regret that we didn’t appreciate the sweetgums while they were common. In the Athens area, a walk around Memorial Park Lake offers a chance to take in the sweetgum’s beauty. This article was originally published in the Urban Forager Column of the Athens Banner-Herald, Sunday, October 31, 2010.